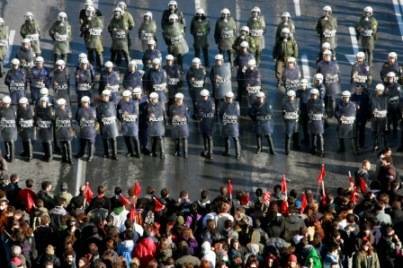 The Greek working class is angry, and with good reason, with the attempt to load responsibility for the bankruptcy of the Greek State onto their shoulders. We maintain instead that it is the international financial institutions and the European Union who are responsible. The financial institutions have plunged the world, and Greece in particular, into an economic and social crisis of historical proportions, forcing countries into debt, and now these same institutions are complaining that certain States risk not being able to repay their debts. We denounce this hypocrisy and say that even if Greece – and all the other countries – can repay the debt, they should not do so: it is up to those responsible for the crisis – the financial institutions, not the workers – to pay for the damage caused by this crisis. The Greek workers are right to refuse to pay back their country’s debt. We refuse to pay for their crisis! Instead, let us shift the capitalists into the firing line: Greek capital generates some of the biggest profit margins in Europe due to its investments in the poorer Balkan countries, the absence of social protections, collective guarantees and a minimum wage for Greek workers, not to mention the country’s gigantic black economy in labour and an even greater exploitation of immigrant work. Greek capital is also very lightly taxed, due to the weakness of the State (with regard to the rich) and major corruption which permits fraud and tax evasion on a massive scale. So it is equally up to Greek capitalists to pay for this crisis. We also denounce the attitude of the European Union. The EU was presented to us as a supposed guarantee of peace and solidarity between the peoples, but now it is showing its true face – that of acting as an unconditional prop for neoliberalism, in a complete denial of the notion of democracy. As soon as an economy becomes mired in difficulties, all pretence of solidarity evaporates. So we see Greece being scolded and accused of laxity, with insulting language bordering on racism. The “Europe which protects us” that liberals and social-democrats extolled at the time of the scandalous forced adoption of the Lisbon Treaty (particularly in France and Ireland) now seems a long way away. As far as actual protection goes, the EU and the financial institutions have combined their efforts to frog-march Greece towards the forced dismantling of public services, through austerity plans that recall the “Stuctural Adjustment Plans” of the IMF: the non-replacement of staff, wage freezes, privatisations and VAT increases. Today the EU is demanding that the retirement age be moved back to 67, not only in Greece but also in other countries, and is also threatening to dismantle the social welfare system. In this way they are opening new markets for investors, while guaranteeing the assets of rich investors, to the detriment of the basic interests of the working class. It is a Europe of the ruling class, and one which we must all work together to oppose. This is why we call for participation throughout Europe in solidarity initiatives with the Greek working class and with future victims of the onslaught of the banks. Against the values of greed and rapacity that the European Union is based on, let us respond with class solidarity! Greece is a test case for the social dismantling that awaits us all. This policy is being enacted by all the institutional parties, from out-and-out bourgeois to liberals and social democrats, by every government and by all of globalised capitalism’s institutions. There is only one way to hold back this policy of barbaric capitalism: popular direct action, to widen the strike movement and increase the number of demonstrations all across Europe. ‹ PreviousTerre’Blanche is Dead; Long Live the Workers!